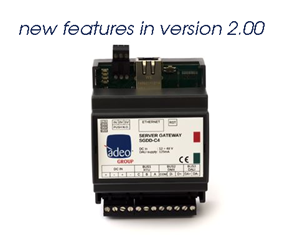 Adeo Server Gateway SGDD-C4-3 is a multi-output device which operates on network level and allows to carry data packs toward fieldbus communication systems such as DMX512 and DALI, so as to provide an advanced light control. Adeo Group sponsored the driver development and provided a SGDD unit. Driver is free and works only with SGDD-C4-3 (or 2) Server Gateway by Adeo Group. In server gateway Web Interface and in Composer Properties set the same IP Address (default 192.168.1.4). Install driver for dimmable light or for RGB light and connect properly on gateway channel in composer connections tab. The gateway also runs simultaneously DMX (512) and DALI (64) bus. It's possible to use the DALI dimming curve or the DMX linear dimming. The gateway supports RampToLevel directly in hardware manner. The lights drivers support the Control4 Advanced Lighting. It's possible to set the last value before power-off as next power-on value. The HSV driver controls RGB values with unique dimmer slider. The 100 colors are selected on the HSV color . The relays driver allow to control 6 channels connected with an DMX/DALI output device. SGDD-C4-3 does the addressing of DALI devices.